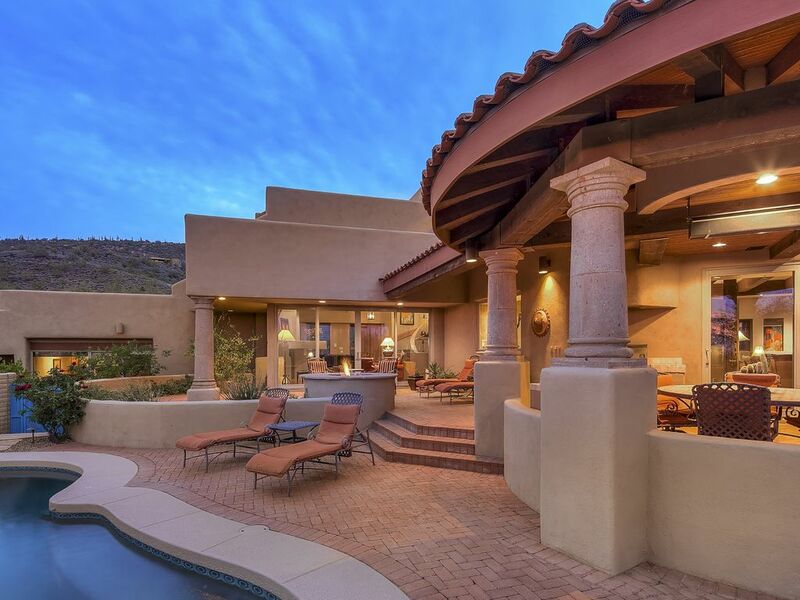 Tilpasset Scottsdale, Arizona residens, som ligger i det private feriestedet i Desert Mountain. Effektiv 1. januar 2019, dette hjemmet er tilgjengelig for 30 dager leie, eller for 7 dagers leie til Desert Mountain Club medlemmer eller eiendomsbesittere. Vakkert innredet med over 4300 kvadratmeter boareal, 3 soverom med eget bad, pluss 2 halv bad. Stor øvre nivå pute med tvilling skjule en seng, våt bar, innebygd kontor og utsikt patio med golfbane, fjell og by lys utsikt. 3 gasspeiser. Kokkens kjøkken med granitt og travertin benkeplater, rustfritt stål apparater, fullt utstyrt med essensielle pantry elementer og krydder. Privat utendørs stue med moden vegetasjon, basseng og spa. Innebygd gass BBQ, utendørs spiseområde og stor brann pit. Babyflygel. To terrengsykler. Pakke n'Play for de små. DirectTV gjennom hele. Trådløst internett. En rolig ferie nær Carefree og Cave Creek golf, restauranter og shopping. Vi ser frem til ditt besøk! Scottsdale, Arizona residens, ligger i det private samfunnet av Desert Mountain, fullt møblert for ukentlig, månedlig eller lengre leie. Over 4.300 kvadratmeter boareal, 3 soverom med king size-senger og en-suite bad, 2 halv bad, stort øvre nivå hylle med full sovesofa, våt bar, Sub-Zero bar kjøleskap og ismaskin, innebygd kontor og utsikt patio med Renegade golfbane, Pinnace Peak, fjellutsikt og bylys. Granitt og travertin benkeplater, rustfritt stål kjøkkenapparater med Sub-Zero kjøleskap, flygel med elektrisk spiller, tre gass peiser. Privat utendørs oppholdsrom med moden vegetasjon, basseng og spa, bygget i gassgrill, uteservering og stor brannkasse. Bose Lifestyle 48 lydsystem med innvendige og utvendige fjernhøyttalere, kabel-TV og trådløst internett. Oversize to bil garasje. To terrengsykler. We usually rent in the Kierland area. Our original plans changed and we opted for a change of pace more north in Desert Mountain community. It was a GREAT choice. A whole different feel and experience that 3 generations of our family enjoyed. The home is lovely and very comfortable. Perfect layout and outdoor area. Our kids enjoyed hiking nearby Tonto National Forest, Pinnacle Peak, and Black Mountain. We got enough workout walking in the beautiful natural rolling neighborhood and then all hanging out in the beautifully done backyard pool area. This is the 12th home rental we have had. It could not be improved upon. Lovely, very clean, yet very comfortable/homey and great layout. It was built to handle larger groups yet two people don’t feel lost in it at all. Barry was delightful to work with. He called day before our arrival to say it had just snowed in Scottsdale for first time in 10 years! He did not want us to be disappointed in our visit and offered to let us change our dates a little. We opted to stick w original plan and snow was gone in a day or so but really appreciated his thoughtfulness. All around great home, neighborhood and experience. We highly recommend! Barry was awesome to deal with, added a few extra days that's how great it was. Barry will email you back in no time flat with any questions you might have. A beautiful home in a lovely gated community! We had a wonderful stay in Desert Mountain. The home is beautiful and the gated community is gorgeous. The towels need replacing as they smell very musty. The coffee pot is a single serve which is difficult with multiple people. Other than those two things, we had an incredible stay. The home really is beautiful!! So comfortable with several people...absolutely perfect for an extended vacation. We will definitely be back!! Thank you for the nice review, and we’re so glad you had a wonderful stay! We have a Keurig and a small drip coffeemaker, and I’m sorry if they were difficult for your group. We would have been happy to send over a larger machine if we had known 😳�. Sorry to hear about the towels as well. We’ll haven’t had that feedback before, and we would have replaced them as well if we had known. I’m guessing they may have been in the closet for a bit, and We’ll definitely refresh them as needed. Happy Trails to you and yours, and have a wonderful holiday season! The house is spacious, clean, well-equipped (pool, hot tub, fire pit, music, tv’s, bicycles, observation deck), and conveniently located. The hosts are extremely gracious and make you feel welcome. We had a fantastic week in Desert Mountain! Very well maintained and equipped home. Owners very accommodating. The house is great. 3 bedrooms all with private baths. Great sitting room upstairs as well as really big and nice back porch around the pool and spa. Very spacious and nice house. The owner ( Barry) was great. We had several questions while we were there and he always responded to emails immediately. I would highly recommend this house to anyone and would stay there again. It is 5 star accommodations. Fire miles til Carefree restauranter, shopping og aktiviteter. To miles lenger til Cave Creek restauranter, shopping, Old West saloons, bull riding, aktiviteter. Please note that the Desert Mountain Club amenities, including restaurants, golf and fitness center, are members-only.